The sophomore starter was a big part of leading the Lions’ to a 6–4 record and a share of the West Jersey Football League National Division title. Cherry Hill West’s Nick Arcaroli throws a stiff arm as he scrambles with the ball during Wednesday’s game against Cherry Hill East. 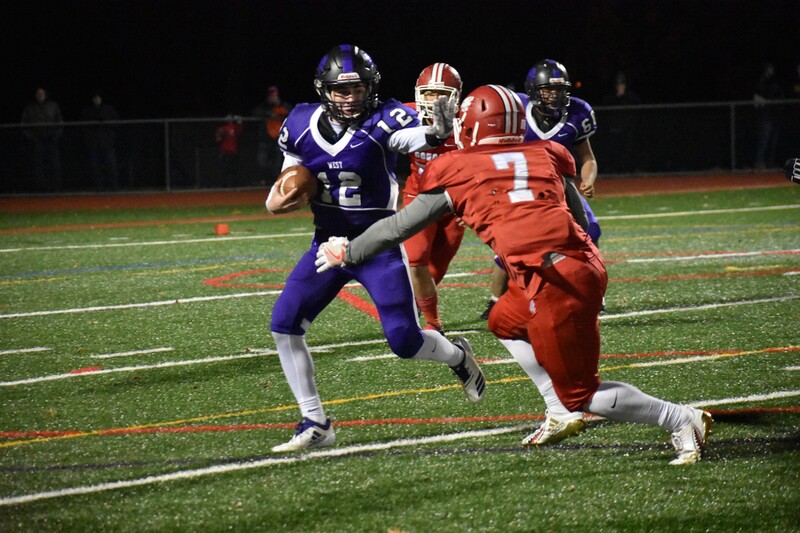 The 2018 season may have been Cherry Hill High School West sophomore Nick Arcaroli’s first full year as a starting quarterback, but he certainly didn’t look like a first-year starter to head coach Brian Wright. 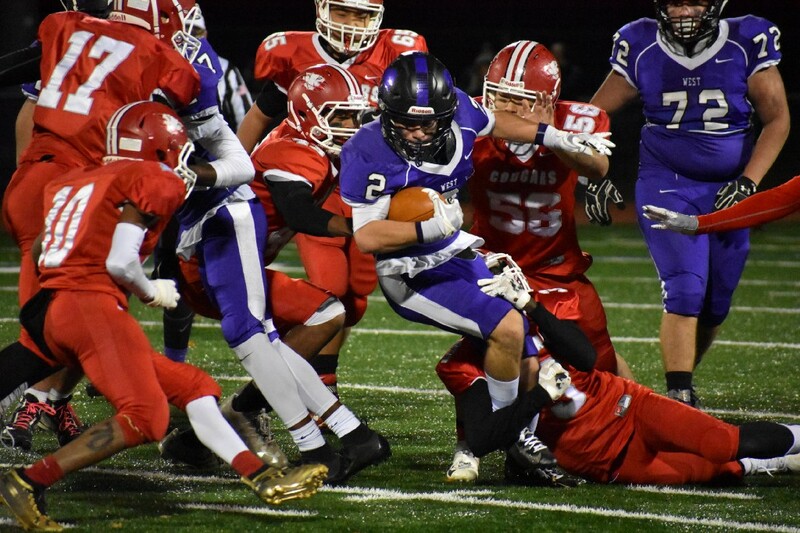 Arcaroli’s throwing ability, poise and toughness were a big part of Cherry Hill West’s 2018 success. In the season finale on Wednesday, Arcaroli’s two first half touchdown passes helped the Lions defeat Cherry Hill High School East, 22–7, giving the Lions the Al DiBart Memorial Trophy for the sixth straight year as well as a share of the West Jersey Football League National Division Championship. The Lions finished tied for first place in the division with Triton Regional High School. Cherry Hill West celebrates after winning The Boot for the sixth straight year on Wednesday night. The Lions defeated Cherry Hill East, 22–7. Arcaroli’s success in 2018 can be seen in his statistics. Last Wednesday was the sophomore’s fourth game with two or more touchdown passes. Arcaroli’s biggest game came on Oct. 26 when he threw for 242 yards and four touchdowns in a win over Cumberland Regional High School. What can’t be seen in the numbers could be seen on the field on Wednesday. The Cherry Hill East defense made a number of big hits on Arcaroli throughout Wednesday’s game. Arcaroli was visibly limping multiple times during the game had to leave at one point during the second half. However, he came back in and mostly played the rest of the way, only coming out in the game’s final minutes. Last Wednesday’s game also showcased the connection between Arcaroli and junior wide receiver Johnny Ioannucci. Ioannucci was the Lions’ leading receiver in 2018 and caught more than half of Arcaroli’s touchdown passes during the season. On Wednesday, Ioannucci was at the receiving end of a 40-yard and 20-yard touchdown pass from Arcaroli. Johnny Ioannucci tries to run through a slew of Cherry Hill East defenders in the second half of Wednesday’s game. Building chemistry with all of the Lions’ skill position players has been important for Arcaroli. He said the biggest area he’s improved in is communicating with his teammates and trying to play to the offense’s strengths. “(I’m) coming together with my receivers, asking them what routes they like, what they see in the defense and just hooking up with them,” Arcaroli said. The good news for Cherry Hill West is Arcaroli has two years ahead of him with the Lions. Additionally, two of the Lions’ top receivers, Ioannucci and Hakim Melvin, will also be back next year and they will be joined by a strong group of underclassmen. Wright believes there is plenty of reason for optimism about the future of Cherry Hill West’s football program.